After a very successful seminar on healthcare imaging an IT, PACS certification and troubleshooting in 2015, we'll be back from April 11-15 with an expanded seminar to include the same topics and additional HL7 (version 2 and FHIR) sessions, as well as healthcare imaging and IT project management and advanced topics on PACS. We will have again an impressive faculty, i.e. Ted Klein from the USA, who has been involved with HL7 standardization since its inception and will be teaching HL7 version 2 and the new FHIR standard, Jamie Osland from Australia, who is very involved with PACS certification as he is on the board of PARCA, who will be teaching heathcare imaging and IT project management based on his wide experience as a consultant in this field, and Herman Oosterwijk, the author of several textbooks, including on PACS and DICOM and an expert trainer/consultant in this field. Note that there will be two simultaneous tracks, one on standards and one on imaging. This training seems very timely as new heakthcare imaging and IT initiatives in the region will require additional skills for the professionals involved to train, support, install and integrate these sophisticated systems. See the OTech website under "training schedule" for the complete curriculum and sign-up information. Looking forward to see you in Singapore! 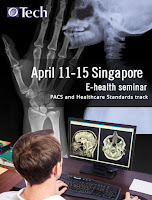 I am glad to see healthcare imaging and IT project management and advanced topics on health. The . cardiology fellowship personal statement is very important to have specially when you are in deep study. Visit this page to know how to catch a cheater using special apps. How many PACS SA's do you need? HIMSS2016: Imaging is still an IT stepchild.